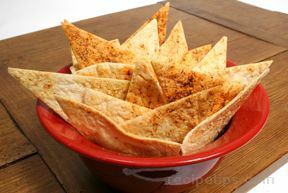 Light cracker that is great with chili or dips. Cut each tortilla into 6 triangles and brush on vegetable oil on one side of each. Place oil side up on a baking sheet. Bake until crisp, 25-30 minutes. Sprinkle each with a small amount of seasoning salt and chili powder or to taste. Serve with your favorite salsa, dip or chili.